I originally created this build thread over at Model Train Forums. I used links to my Photobucket account, but when they launched their extortion scheme and broke all the links, the photos disappeared. I tried to rebuild the thread by using MTF's photo uploader, but something just isn't working right and the photos keep disappearing. So I am going to re-post it here, and I'll add a link to it over there. This was originally started on 6-21-15. I am going to be building a paint booth for my airbrushing activities. I will be using ONLY acrylic paints, no solvent based paints for me anymore. (I'm weird enough as it is, don't need to make it worse. Knowhutimean, Vern?) The booth will be 27" wide, 18" high, and 18" deep. It will have a 24" single bulb fluorescent light, and ventilation will be a 50 CFM bathroom fan. Filtration will be a 14x20x1 el cheapo furnace filter, the kind that has loosely knit fiberglass mesh. I've read that you don't want to use a good filter because it will restrict airflow too much. The fan and light fixture will be independently switched. There will be a 14 gauge 3 wire cord coming into the switch box, and 14 gauge stranded wire cord running to the light, with 14 gauge NM cable powering the fan. The first thing I did was to prepare the light fixture. The light fixture I am using is a 24" Metalux single T8 lamp fixture from Menard's. Here I have it laid out and am ready to start wiring it up. This little plastic connector is how the power wires are supposed to be connected, just push them in. Ummmm......... no. This was promptly cut off and disposed of. In this pic, I have done several things. I used a 17/64 drill and made 4 holes in the 'dimpled' areas on the light housing. I then used 1/4" bolts to secure the housing to a piece of 27" x 5" of 3/4" plywood. This will be the valance for the light, and I will be making this valance removable from the front of the booth to make bulb changes much easier. The top of the booth will also have a slot cut in it for the cord, but more on that later. The excess length of the bolts will be cut off. I have installed a 3/8" NM cable connector through which the 14 gauge power cord has been passed. I have also used wire nuts to connect the power cord to the light fixture wires, and installed the ground screw. The other end of the ballast. The bolts are a bit long. The light plugged in and functioning. I ALWAYS use a bulb protector with fluorescent lights. I have seen what happens when one of them shatters, and it's not pretty! I also cut the 27" by 18" piece of 3/4" plywood for the base. I haven't decided yet on whether to have solid plywood for the top, or whether to cut a 'sun roof' in the top and use a piece of plexiglass to allow additional light. I'm leaning towards the plexiglass idea. Next I need to rip down some 2x4's to get true 1"x1" strips. But that's it for right now. More to come! Well, I've been plugging away at it as time and energy allows. I marked the lines where things will go, and drilled some holes for the screws that will be coming up from the bottom into the 1"x1" strips. I got my 1"x1" strips ripped down from a 2x6 I bought at Menard's. I placed one along each side 1/2" from the edge to allow for the side panels, and when I went to test fit one for the bottom of the filter slot, I realized I hadn't cut any long enough. So I used two cut down to fit. I'm not real bugged by it since this area will be totally hidden anyway. Here I have placed some strips so you can get an idea how it's going to come together. the space between the strips is where the front of the filter housing will sit. Next I glued down the strips for the bottom with Titebond wood glue, then used some #8 x 1-1/4" screws from the bottom to fasten the strips into place. They aren't going anywhere! Next I glued and screwed the side panels on. I used the same screws as for the bottom, except that the screw running into the end of the filter slot strip is a 2" black construction screw. Since that screw is running into end grain, I wanted the extra length. Here I have slipped the front of the filter housing into place so you can see how it goes together. It's not fastened in yet. I still need to cut out the area for the filter. There will be a 1x1" strip along the sides, front and back, as well as one running along the top. That will give me something to fasten the filter front to, and also provide a fastening surface for the top, and the light valance along the front. Her is a view of the back. I still need to cut the back panel out a piece of 1/2" plywood. I also need to determine how high off the bottom I want the filter to sit. The filter size is 14x20x1. Since the sides are 18" and the filter is 14" high spacing it up 2" will center the filter vertically. 18-14=4, 4 / 2=2. To center it horizontally, I would need to have each side 3-1/2" from the outside of the booth. 27-20=7. 7 /2= 3-1/2". Aesthetically, that would look best, but since most airbrushing is done either dead on horizontally or at a down angle, I'm wondering if having the filter a bit lower would actually help improve the entrapment of particulates. I'm also wondering about the placement of the fan on the back of the booth. Should I center it vertically or have it lower to help catch particulates, given the normal airbrushing angles? Or is I overthunkin' all this? Made some more progress on the beastie. I decided to cut down on the height of the valance for the light to provide a bit more working room. I also took the light apart and replaced those long 1/4" bolts with some 3/4" long Philips flat head machine screws. These go into some 1/4" T-nuts mounted on the face of the valance. The valance fastens to the booth with some 2" long 1/4" pan head bolts. There are some more T-nuts driven into the back of the 1x1" front uprights. The top panel will be slotted to provide clearance for the cable clamp. In this pic you can see some metal protrusions on the light fixture, as well as a small screw which was used to fasten the light socket into place on the fixture housing. Those protrusions were bent over and or removed, and the screw was replaced by a 3/16" pop rivet. The top is much cleaner now. I decided to center the filter in the back of the booth. I cut the front piece from 3/8" plywood. While cutting the hole with my jig saw, the saw just would not cut straight, even though I was using a 1x2 as a cutting guide. The blade just wanted to wander all over everywhere! I thought maybe the blade was just dull, so I went to replace it. No more blades. Off to the store to buy some blades. Came home, put on a brand new blade, same thing. Wandering and wobbling like a drunken sailor! I then took a good look at the saw ( a Tool Shop brand cheapy from Menard's that I've had for a whole bunch of years) and noticed that the blade guide (the roller assembly that is supposed to ride on the back of the blade to keep it straight and steady) was about 1/4" back from the blade! I don't know how that happened. I tried to move the bottom shoe forward (it's all one assembly on that saw) but to no avail. The saw was history. Came home with the saw and tried to fix the mess that the old saw had made. I got the middle of the piece cut out, but it wasn't too straight on one side, as the saw kept wanting to follow the path of the old saw. Not a problem. I took my small Porter-Cable hobby router/laminate trimmer with a straight cut bit and got it all looking pretty decent. Still not 1000% perfect, but good enough for my boss. Here it is in place, glued and clamped. I needed a way to pull the sides tight while the glue dried. Now, I know that that amateur handyman, Red Green, likes to go around babbling about duct tape being "the handyman's secret weapon." Not so, young Padawan! I will need to rip some more 1x1 strips, but I still have 2 2' foot sections of that 2x6 I bought a few days ago. Then I'll frame up the filter slot and give everything a good coating of gloss white latex house paint. Then I'll cut a piece of plywood for the back and figure out where the fan needs to be. Still plugging away at it! I got the filter housing framed in. I still need to add some 1x1" strips along the sides of the booth so the glue on the back will have something to adhere to. Next I cut out the panel for the back from 1/2" plywood, and started measuring to determine where to mount the fan. The bottom edge of the fan housing will be 3-3/4" from the base of the booth. My chicken scratch lines. Centering up the fan, and determining where to cut the opening. Once the opening was cut out (jig saw to the rescue again! :thumbsup , I cut and glued some 2x4" stock for a fan support. If you look closely at the left side of the vertical (in this pic) piece you will see two 1/4" t-nuts. There will be 1/4" pan head bolts holding the fan housing onto the fan support. I will also be driving 2 2" screws down from the top of the support into the bottom piece, and 2 2" screws from the other side of the back into the bottom piece. I won't be relying purely on the glued joints. These two 1/4" holes will have 3/4" long 1/4 inch carriage bolts coming from the other side of the back and glued as well. These correspond to holes in a piece of 22 gauge sheet metal that I used to make a bracket for the top of the fan housing, and pop riveted it into place. Now to wire up the fan. The fan has a removable corner piece that has an outlet with wires attached to it. The three wires from the fan outlet were wired to the corresponding wires from the incoming NM cable, which is secured to the fan housing with a 3/8" NM cable clamp. In the lower left corner you can see the 22 gauge brace I made for the top of the housing. Astute wiring experts will say "Hey, you didn't ground the fan housing." Read on. Here is the outlet I mentioned earlier. You can see that the ground wire is riveted to it, and if you look at the right side of the outlet you will see that the ground is actually connected to the outlet support. This support snaps into the housing, so the sheet metal of the housing is grounded through the ground wire in back of the outlet, so a separate ground is not needed. You can also see the brace I made, and one of the 1/4" holes for the carriage bolts. Here is the fan unit, assembled, wired and ready for mounting. In the upper right is the outlet. Time to start wiring the switch box. I am using a deep plastic 2 gang switch box. Incoming power will be through a 6 foot 3 wire 14 gauge power cord. The fan and light will be individual switched. To do this, it is necessary to run two pigtails off the hot (black) wire, and three pigtails off the ground (green or bare) wire. The neutral (white) wires from the fan and light will be wired directly to the incoming neutral, so no pigtails are needed for the neutral. The two hot pigtails run to the bottom terminals of the switches, as do two of the ground pigtails. The third ground pigtail will be connected the the grounds from the fan and light. I diagrammed this out and showed it to the plant electrician where I work, and he confirmed that this is the proper way to power and switch two fixtures from one incoming power lead. Here you can see the ground and hot pigtails, with two of the grounds hooked to the switches. Here you can see the two hot pigtails hooked to the switches. Next thing to do is paint the cavity between the filter housing side and the side of the 1x1's for the back to glue to, and cut the piece for the top. I have decided not to put in a "skylight" at this time. The top will be removable, so I can add one later if I feel I need to. Getting closer to having this thing done! I got both switches wired up to the fan and light. I like to wrap the contacts of my switches with electrical tape as an added safety measure. Lots of light in there with the light on! It's hard to see in the pics, but the fan is running. The electrical box will be screwed to the front where the clamps are, and I plan to epoxy the side of the box to the booth so there will be no floppiness there. Then I removed all electrical equipment and cut the top. The top will be held on with 1/4" round head machine screws going into T-nuts in the bottom of the side crosspieces. I glued another strip of wood under the cross pieces to hold the T-nuts captive. They aren't coming out. I cut a slot for the cable clamp on the light fixture. I do have one extra hole on top that will get a piece of 1/4 dowel glued into it. I added some handles to the sides to make it easier to move this. These are attached with 1" long #12 flat head machine screws, with flat and lock washers on the inside. Now, I need to get some gloss white latex paint and give this thing a couple coats. It may be a few days before I get to that though. Well, construction is complete. I just need to paint it and put the electrical gear back on, but i think I'm done posting about this. I hope this has helped someone, or maybe given them some ideas about how to build their own booth. Well Done. A better alternative for the lighting would be LED strips, no chance of shattering. I haven't been on P'bucket for a long time either. They are now charging a monthly fee, 3 levels, starting at about $4, but it's not very easy to find your stuff. One caveat, be careful using solvent based paint. Since the fan you used has the blower motor in the air flow, all the solvent fumes have to go past the motor. If it sparks or gets hot, it could cause a fire hazard. In most cases with model railroad spraying the amount of fumes is fairly low, just be aware of doing something like spraying a large amount directly from a rattle can into the fan (some spray paints use propane as a propellant). I have a spray booth and I hope you enjoy it as much as I do mine, it really makes painting easier. Thanks, Toot! One other reason I went with the fluorescent light/ tube combo is if the tube ever does get dirty and cuts down the light transmission, I can just replace it and restore the light intensity. With the light the way it is, though, I don't worry too much about it getting dirty. As far as P-bucket is concerned, if they went out of business it wouldn't bother me at all. Thanks, Lynn! I had fun building this. Hi, Dave! I don't spray anything but acrylics in my paint booth. Enamels or lacquers in spray cans get sprayed outside. I don't spray them with my airbrush, ever. If I use enamels or lacquers it's just a tiny amount on a brush, such as for wheelset faces. I've had comments that "Oh, you need a much bigger fan! That's only about 50 CFM!" Well, the interior of the paintbooth isn't that big, and the fans moves the air quite well. I really do enjoy using my paintbooth, and I find myself doing virtually all of my painting, both spraying and brushing, in it. Nor I, I only went on to see what they might be now charging, because I'd had a message from them about it. The site itself has taken a further step backward from the mess they made of it, when the new owners "revised it". Even more of a run-around to find your albums than after that debacle. I don't spray anything but acrylics in my paint booth. Enamels or lacquers in spray cans get sprayed outside. I don't spray them with my airbrush, ever. Shouldn't be an issue anyway. That was my first concern when I saw the build, but then I looked at the picture of the fan again. As best I can tell, that motor is designed after an original Tesla shaded pole induction motor. It has no brushes, hence no sparks to ignite anything. I have no idea what what a shaded pole induction motor is, but it's still good to know it won't go boom! I made chiming in to late, it seems that you are way on your way to build everything. But still few notes, (perhaps for others considering building). Material - Melanie white panels. Dirt cheap, clean, one might have some on hand already. If not Craiglist probably has bunch if freebe furniture you can salvage into making a cabinet. Provides for a bright interior. Top - transparent acrylic sheet will allow any table top light to shine through from above. CFM. Im afraid I will need to join the nay sayers on that bathroom fan. That's what I started with and it proved to be insuficient (I paint with solvent based and canned paints too) I would suggest to look at something like laser exhaust fans. My compact desktop unit is below. 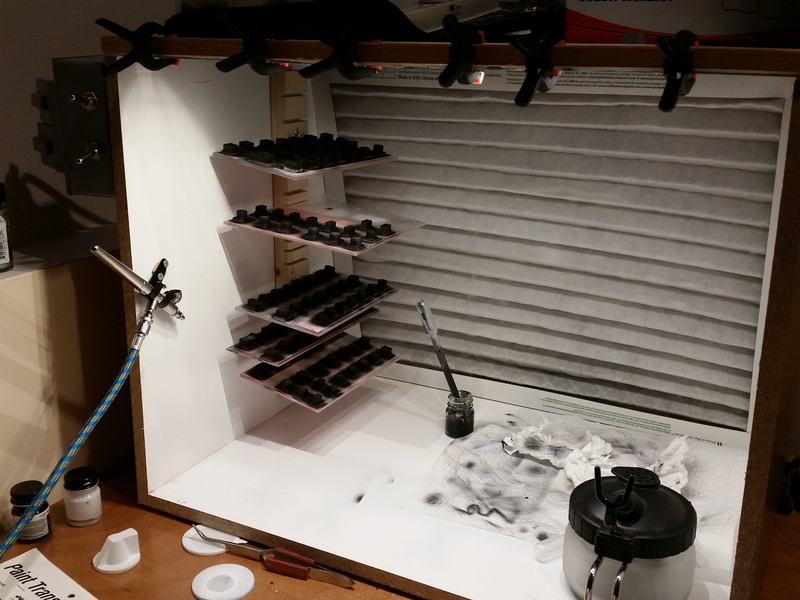 Nice spray booth, Anton! It's a lot larger than mine is. The fan is rated at 50 CFM. My booth is 3.3 cubit feet in volume ( 13" x 18" x 25" = 5850 cubic inches. Divide that by 1728 (the number of cubic inches in a cubic foot) = 3.3). The fan will exchange the air in the booth over 15 times per minute. For solvent based paints you also need to vent the booth to the outside. I airbrush acrylic paints exclusively. Anything solvent based is done outside. Nice paint booths! Simple construction and functional. I"ll have to try to make one after the holidays. Might have missed it, but where does the exhaust (or what ever is the right term) go? Do you use something like a dryer duct and feed it out a window? Or is the filtered air so clean that it just goes into the room? I don't have any way to run a duct from my basement, so I am probably going to wait until we get my younger son's old room cleared out and put a table by the window for a paint booth that could expel right out the window. I don't have an airbrush, yet, but would like at least to have a decent way to work with rattle can spray paint more than the three to five months of the year when I can use it in the garage. I'm kind of curious to know if this saved enough money to be worthwhile. You can buy a booth that size, albeit for several hundred dollars, but you wouldn't have to worry too much about the thing exploding or burning down the house if you messed something up. From the looks of the materials list, you may have saved some money, but not necessarily that much. If it were me, the lighting would be behind a sealed cover that prevented any of the fumes from getting to the light with the light only accessible from outside of the booth. I'd probably also look into paying for the exhaust system so that you don't have to worry about what happens if there are any sparks. Still, kind of a cool project.